Today being Sunday, we ate heavy breakfast. By afternoon, we wanted to eat something light and easy on stomach. I made ven pongal or khara pongal for lunch. Usually ven pongal is made for breakfast but it was our lunch today. Ven pongal is a type of moong dal khichdi except that the seasoning is different. 1. Wash and soak rice and moong dal together for 10 minutes. Drain. 2. Heat ghee in a pressure cooker and add cumin seeds. When they change color, add ginger paste and crushed peppercorns. Fry for 1 minute. 3. Add rice and dal and stir fry for 1 minute. 4. Add water and salt. Pressure cook for 4-5 whistles. 5. 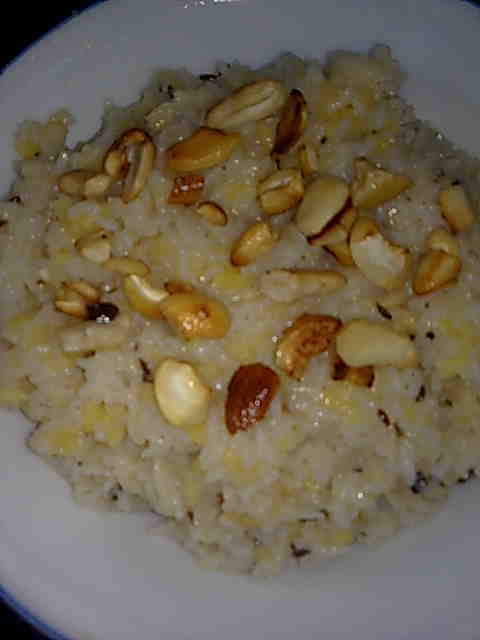 Garnish ven pongal with fried cashew nuts and serve hot.